I never thought I'd be one of those bloggers, the kind that post gimmicky heart-shaped or red velvet creations to mark the otherwise utterly meaningless fourteenth of February. To be honest, these were made a couple of weeks ago, and they just happen to be heart-shaped, because I thought they'd make more interesting photos than simple rounds. But ignore that if you're a hopeless romantic: these would also make a lovely gift for your Valentine. Or your colleagues, as in my case. Or your friends. Or your mum. Shortbread doesn't make distinctions. Shortbread is always loving. Dozy Girl has long been one of my favourite Bluebird teas. While I find chamomile on its own a little unpleasant, I am an absolute fiend for lavender and lemon verbena, which I grow on my balcony in the summer, and to which I turn, in their dried form, to soothe me through the winter. 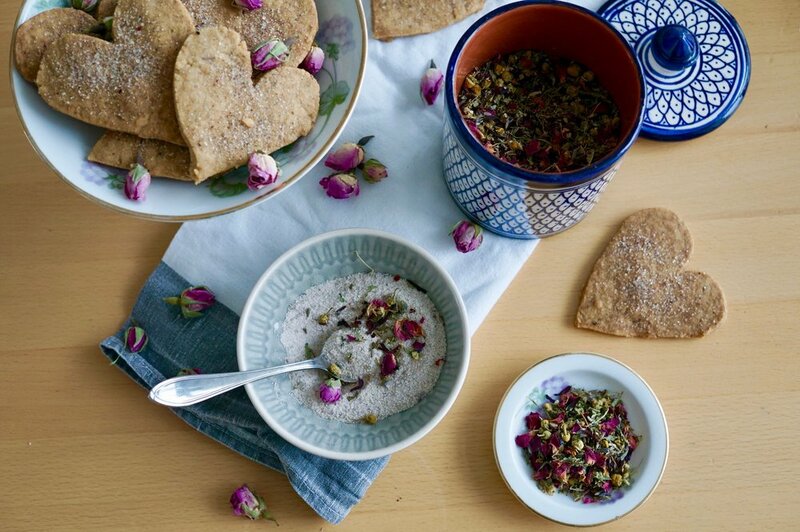 Bluebird’s blend of floral flavours is the perfect thing to help you unwind at the end of a long day, but I also wanted to use its flower power medley in the kitchen. I wanted something as gentle and delicate as the tea itself. This is really two recipes in one. 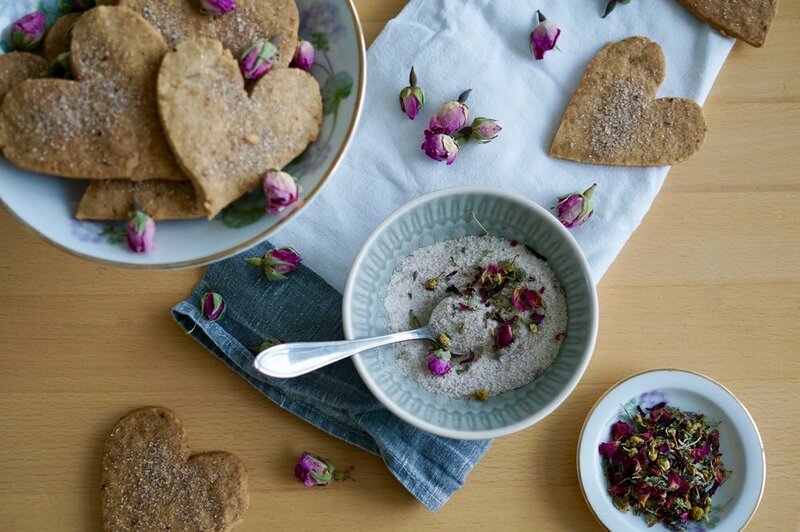 The first, made in seconds, is an utterly divine fragrant sugar, heady with lavender and rose, that can liven up all manner of dishes – try sprinkling over meringues, porridge, cookies or ice cream. You could, of course, use your favourite herbal tea if you don't have Dozy Girl, or a mixture of dried flowers like rose and lavender. The second takes this perfumed sweetness and combines it with the simplest of ingredients: butter and flour. The result is a beautifully crisp yet tender shortbread cookie, an understated delight with the subtle fragrance of lavender. I’ve made them in heart shapes, but you can be creative with cookie cutters if you like. The most important thing is to use quality butter, as that’s the predominant flavour here. The sugar can be stored almost indefinitely in a jar in the cupboard, but I doubt it will last very long. For the sugar, simply place the sugar and tea in a food processor and blitz until combined and very fragrant. Using an electric stand mixer or your own muscles and a wooden spoon, beat the butter in a large bowl until soft and creamy. Add the sugar and salt and beat well to combine. Sift in the flours, then mix to a soft dough. Roll the dough out on a floured surface to 1cm thick. 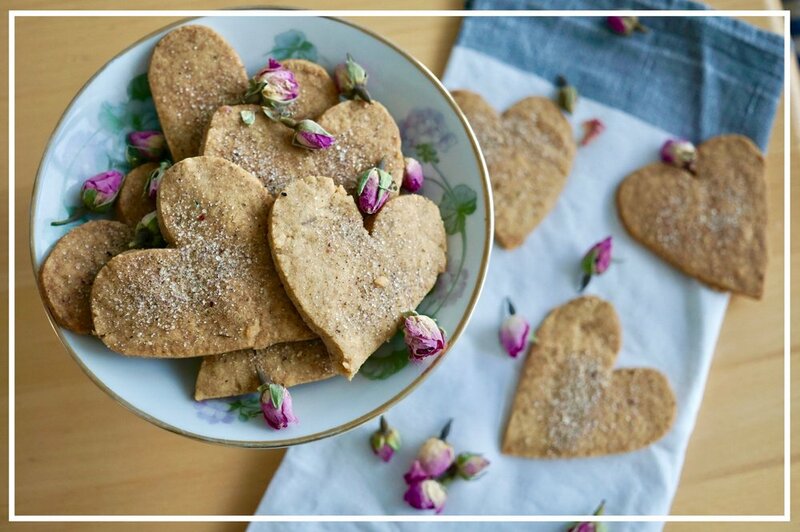 Using cookie cutters or a sharp knife, cut the dough into shapes (I made hearts, but you can make whatever you like). You can also just roll the dough into a log and cut into rounds. Arrange on a piece of baking parchment or a silicon non-stick sheet on a baking tray, then place in the fridge for 15 minutes to firm up. Pre-heat the oven to 150C. Bake the biscuits for 30 minutes. Remove from the oven, leave to cool on the tray for a minute then sprinkle with a little extra sugar. Leave to cool completely before eating.